On the Day 2 of People Matters TechHR Singapore, learn from Netflix’s creativity and out of the box thinking or take a tour to 3M to learn how they approach talent management or experience the Google way of defining workplace among many more tours in the offering. Ever since the advent of digital, businesses across industries and geographies have been struggling to transform themselves to continue having a strong position in the market. In this continuously evolving ecosystem, while there are some who got out from the race, there are some who thrived and lead their way through successful digital transformation. But even for them, the race is not over yet as the world of business hasn’t stopped changing. In fact, innovation and technological development are happening at a much faster rate than ever. Given the pace of change and the increasing competition, learning from each other is what can help businesses take the next leap of growth together. To help businesses with their digital transformation and learning journey, People Matters through TechHR Study Tour in Singapore takes the learning experience beyond the conference halls to the workspaces of progressive organizations including Google, Netflix, Facebook, P&G, 3M, SMU, SUTD, NUS and TCS. HR Leaders attending the People Matters TechHR Singapore conference on 28th February 2019 in Marina Bay Sands will have the opportunity to choose one Study Tour and learn from a deep dive session hosted by one of these progressive organizations on the second day of the conference (1st March 2019). It is no news that Google's APAC headquarters in Singapore redefine the workplace of today. But haven’t you ever wished to experience the same? Register for the tour and from 9:30 AM to 11:30 PM get a deep-dive into Google’s innovative talent practices and visit one of the most amazing offices in Singapore with Sanjeev Somasundaram, APAC Head-Programs Staffing, Google and Daisuke Kawamura, Google - APAC Staffing Operations Lead, Google. Netflix is not only the world's leading entertainment streaming provider but also an organization that has redefined talent and work practices and made their mark as one of the most innovative organizations. To learn more about how Netflix has been able to build this culture of innovation and freedom not just in theory but in practice, register and attend the study tour from 2:00 PM to 4:15 PM. In an interactive session facilitated by Shweta Shukla, Director of Human Resources - Asia Pacific, Netflix, hear the stories that reflect Netflix's learnings and journey of fostering an environment of freedom, candor and innovation at the Netflix office in Singapore. Explore Facebook’s one-of-a-kind culture in the company’s brand new Singapore office between 9:00 AM to 11:30 AM and get an opportunity to deep dive into discussions on leveraging tech to augment talent function capabilities. In the study tour facilitated by Jason Averbook, Co-founder and CEO of Leapgen; Jason Luke McNeal, Director of Workplace by Facebook and Fasai Pongpitaksopon, Enterprise Growth Manager, Singapore Facebook HR Team learn the Facebook way of managing talent and experience the Facebook campus. Singapore University of Technology & Design is an autonomous university in Singapore, focused on design-centric, multidisciplinary curriculum to nurture technically-grounded leaders and innovators. Register for the study tour which is to happen from 9:30 AM to 12:30 PM and learn and discuss more about technology in 2050, and its impact on talent and work. In this tour facilitated by Dr. Jaclyn Lee, CHRO, SUTD. Prof. Lucienne Blessing, Co-Director (International Design Centre), SUTD also get an introduction to Design Thinking, and how to apply it to increase HR’s impact. This also includes a tour of SUTD Fabrication and 3D printing facilities, design center and library. Digital engagement has been one of the key challenges for HR leaders lately. Join this study tour between 9:30 AM to 11:30 PM and get a view of the best practices and initiatives that P&G has put in place, to foster a culture of digital engagement. The session will be facilitated by Sonali Roychowdhury, Head, Asia Pacific, Supply Chain, HR, P&G. The swanky 3M Headquarters in the region hosts an exclusive space to showcase 3M's innovation. Register for this study tour and get an opportunity to Visit the 3M Customer Technical Centre. This particular tour happens from 2:00 PM to 4:30 PM and will be facilitated by Joan Wong, Head of Human Resources, 3M; Cheng Teck Tan, Senior Technical Manager, Singapore R&D Operations & Services and Hazizah Selamat, CTC Tour Master. Attend the tour and find out more about how the organization innovates with purpose and uses science every day to create a real impact on the world. A premier university in Asia, SMU is internationally recognized for its world-class research and distinguished teaching. Attend this study tour at SMU from 9:00 AM to 12:00 noon and experience a masterclass in HR Analytics conducted by the faculty at a leading management education institute in Singapore. The facilitators for this session are Dr. Fermin Diez, Adjunct Faculty, Singapore Management University. A global leader in IT services, consulting and business solutions, TCS is committed to a digital and agile capability building. The Study Tour from 9:00 AM to 12:20 PM across TCS’s Singapore campus will provide an opportunity to experience Virtual Reality booths, Smartwatch, ShineSenior be guided through the pantry by a robot and witness multiple learning and collaboration platforms that the organization is leveraging. Kunnumal Sudeep, Director HR - Asia Pacific at Tata Consultancy Services and TCS L&D Team and Seow Li Dwen Hwee, HR Head, Singapore will facilitate this study tour. A leading global university centered in Asia, NUS is Singapore's flagship university. With facilitators Dr. ONG Soh Khim, Associate Professor, Department of Mechanical Engineering, NUS and Kelvin Tan, Deputy Director, NUS Enterprise learn more about innovative technology in action in the field of business and talent from 9:00 AM to 11:50 AM. As there is so much to choose from and Study Tours have limited capacity (from 20 seats some to 50 seats) and will be booked on a first-come-first-serve basis, make sure you register for the one you wish to attend on time. P.S. Study Tours registration link is now open only for registered delegates. Haven’t registered as a delegate yet? No worries! 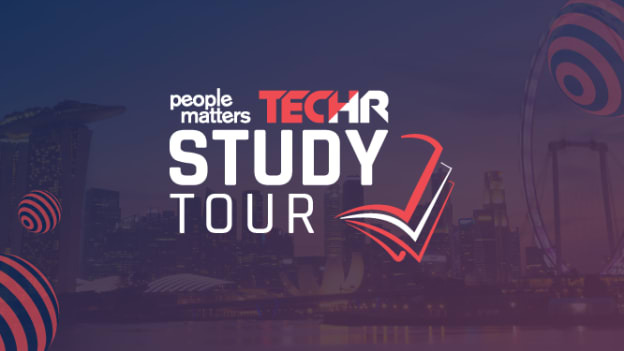 Click here to register for People Matters TechHR Singapore and get more details of the study tour.